The oxidation number of hydrogen in hydrogen selenide is 1. Hydrogen selenide (danger!!) can be made in the laboratory by the direct reaction of the elements but might best be made from aluminium selenide. With considerable care, the reaction between aluminium selenide and water can be used in the laboratory to make hydrogen(II) selenide. 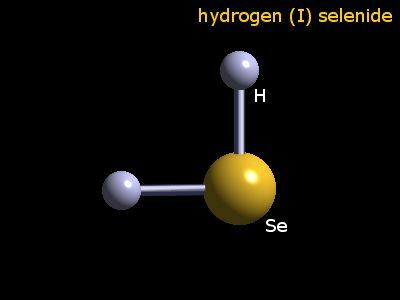 Hydrogen(II) selenide is a colourless gas which boils at -42°C and freezes at -66°C. The table shows element percentages for H2Se (hydrogen selenide). The chart below shows the calculated isotope pattern for the formula H2Se with the most intense ion set to 100%.